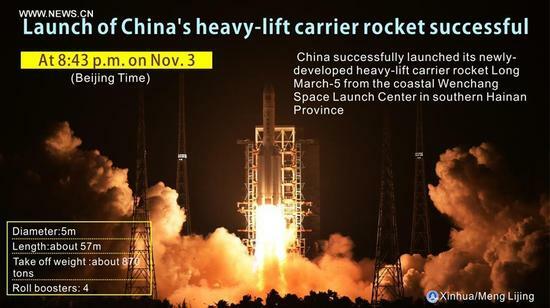 WENCHANG， Hainan， Nov. 3 (Xinhua) -- China on Thursday launched its new heavy-lift carrier rocket Long March-5. 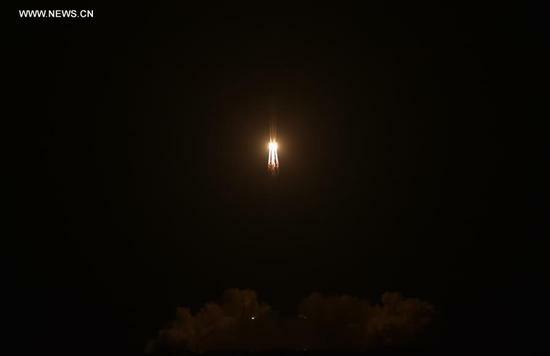 The rocket， which looked much "fatter" than other rockets of Long March series， blasted off at 8:43 p.m. Beijing Time from the Wenchang Space Launch Center in south China's Hainan Province. The payload was sent into the preset orbit about 30 minutes later. The State Administration of Science， Technology and Industry for National Defence (SASTIND) later announced the complete success of the launch. The launch was delayed for less than two hours from the previously scheduled time. 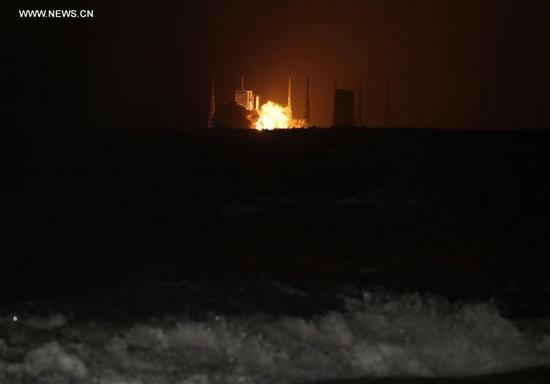 Tian Yulong， chief engineer of the SASTIND， told Xinhua that as it was the first launch of Long March-5 in a new launch site， many parameters needed to be debugged and various systems needed to be matched with each other. "It was normal preparation work to ensure a successful first launch，" Tian said， adding that it caught up with the launch window. The major targets of the mission are to verify the design and performance of the new rocket and test the rocket's flight program， according to China Aerospace Science and Technology Corporation (CASC)， the developer of Long March-5. 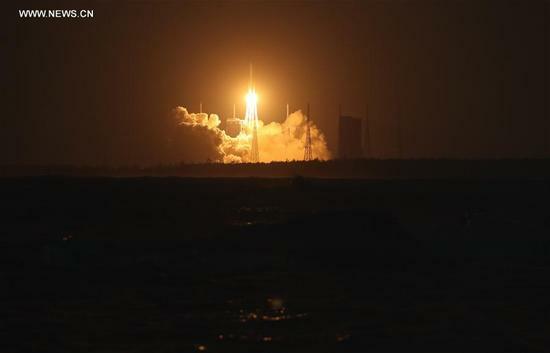 A congratulatory letter sent late Thursday night by the Communist Party of China Central Committee， the State Council and the Central Military Commission hailed the new rocket as the pinnacle of innovation in carrier rocket science and technology. 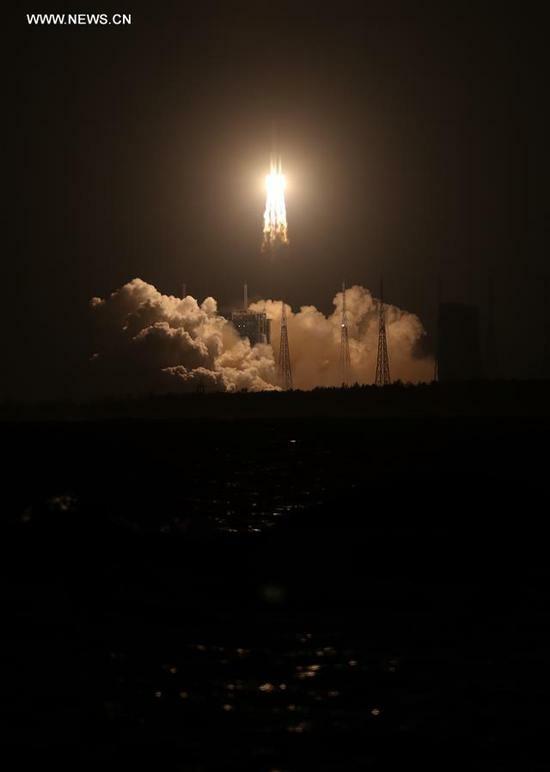 Its successful launch has propelled China to the forefront of the world in terms of rocket carrying capacity， and marks a milestone in China's transition from a major player in space to a major power in space， the letter said. The Long March-5 is a large， two-stage rocket with a payload capacity of 25 tonnes to low-Earth orbit and 14 tonnes to geostationary transfer orbit， the largest of China's carrier rockets. Its carrying capacity is about 2.5 times that of the current main model Long March carrier rockets. According to the CASC， the rocket uses two kinds of fuel， kerosene/liquid oxygen as well as liquid hydrogen/liquid oxygen， rather than highly toxic propellant， making it more environmental friendly and less expensive. The rocket is about 57 meters long， with a takeoff weight of 870 tonnes and a thrust of 1，060 tonnes. It is equipped with eight liquid oxygen/kerosene rocket engines in four strap-on boosters， two liquid hydrogen/liquid oxygen engines in the first stage and two relatively small liquid hydrogen/liquid oxygen engines in the second stage. Li Dong， designer-in-chief， said the rocket was the most complicated of the Long March series with over 100，000 components instead of tens of thousands of components in other Long March rockets. Scientists conducted over 7，000 tests during its 10 years of development. With a 5-meter diameter core stage， Long March-5 is much thicker than China's previous carrier rockets with 3.35-meter diameter core stages. Other launch sites in China are located in inland areas. Accordingly， transportation of rockets rely on railways， so that rockets cannot be too wide. 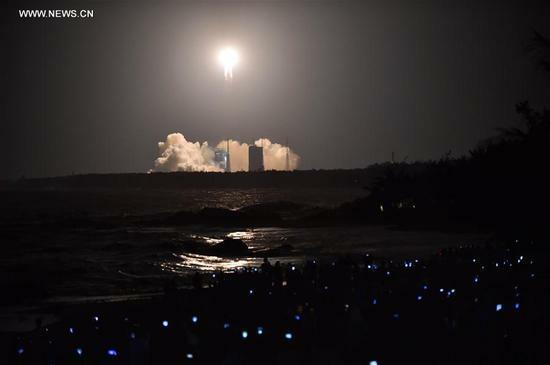 The heavy-lift rocket launched Thursday was taken to coastal Wenchang from the northern port city of Tianjin by ship in early September. "It is not just a simple enlargement of the diameter， it raised new requirements of materials， manufacturing and equipment，" said Lou Luliang， deputy designer-in-chief. Lou said the new technology in Long March-5 would be used in other Long March series rockets in a bid to upgrade all rockets. The heavy-lift rocket is a milestone for China to become a real space power in the world， said Li Dong. Experts said the Long March-5 will also lay the foundation for future rockets with heavier payload capabilities. The new rocket is of great significance as China's space program relies on the carrying capabilities of launch vehicle systems. With the heavy-lift carrier rocket， China can build a permanent manned space station and explore the moon and Mars. In 2017， China will launch the Chang'e-5 probe to the moon， which will bring lunar samples back to Earth aborad the Long March-5. The 20-tonne core module of its first space station will also be delivered by the rocket in 2018. The rocket will launch the Mars probe around 2021. It is the second launch from the coastal Wenchang center. 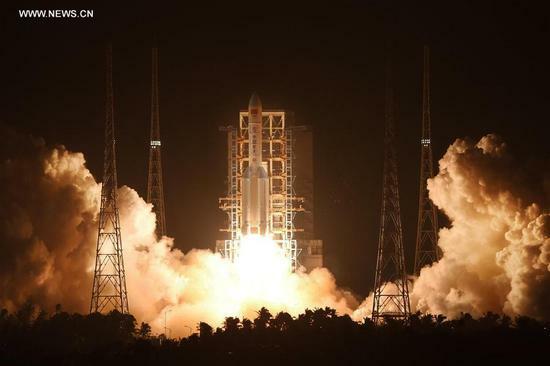 On June 25， China's new generation medium-sized Long March-7 made its debut at the site. On Sept. 15 China sent Tiangong-2 space lab into orbit， making a step closer to the dream of building the country's permanent space station. On Oct. 17， the Shenzhou-11 spacecraft carried two Chinese astronauts to space. Two days later it docked with Tiangong-2. The two astronauts will spend a month in the space lab and return to Earth， making it the longest-ever manned space mission of China. 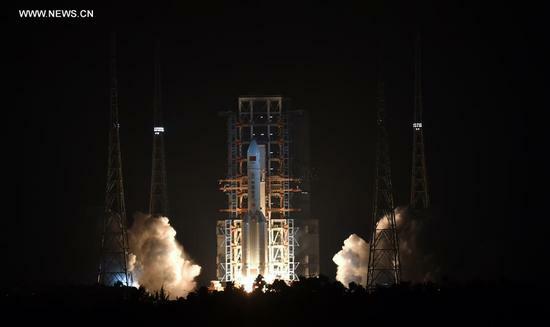 Tian Yulong said at a press conference after the launch on Thursday that China is now developing a mega rocket with the capacity of sending up to 100 tonnes of payload to low-Earth orbit. The mega rocket will probably make its maiden flight before 2030， Tian added.